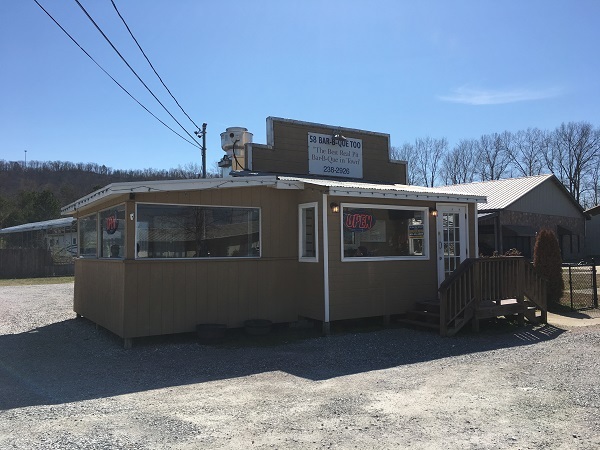 Hwy 58 BBQ, Ooltewah TN (take two) – Marie, Let's Eat! Shortly after moving to Chattanooga last summer, I put together a to-do list of restaurants we’d visited in the past that I’d like to come back and sample again for a “take two” recap. When this joint came up in rotation, I double-checked it in Google and found it had been closed by a fire! Fortunately, they had a second location up and running already to serve the suburb of Ooltewah, and it’s been taking the load while they undertake the long approvals and planning process to rebuild their first site. 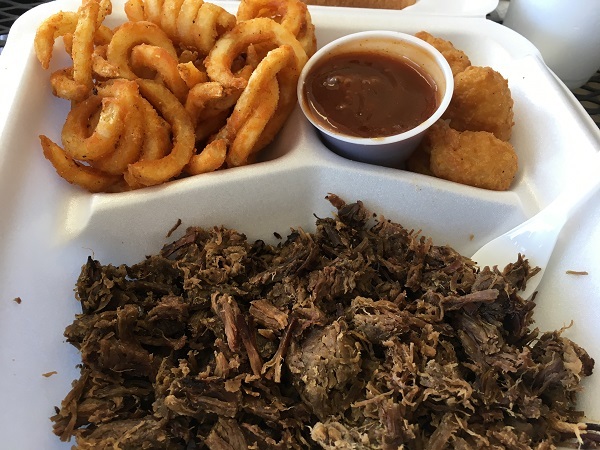 Around the beginning of March, I became anxious to give Hwy 58 BBQ another try. This is one of those restaurants that serve their food underneath a thick layer of sauce unless you remember to ask for it dry. I try to do that, but forget every once in a while. So I looked them up and saw that their original location, which we visited on our way through town in 2014, was closed. The business, which Mike Phillips opened in the early nineties, was destroyed by fire the week we moved here, and it was all over the local news. Well, you know, we were kind of busy unpacking. I hadn’t started reading the local news yet. Since moving here, I’ve grown a little bored of the very similar taste to everybody’s chopped pork, and so I’ve ordered chopped beef at a few places instead. Old Plantation’s is quite good. In Atlanta, chopped beef is slowly becoming a thing of the past; only the older restaurants serve it. Newer ones want to try their hand at sliced brisket, and, by and large, do a very good job of it. Chopped beef is much more common in Chattanooga. Overall, I certainly prefer pork, but I appreciate the variety. So we arrived one Saturday morning shortly after they opened, remembering that this place serves curly fries quite like the good ones that the Arby’s fast food chain serves, and I resolved to have some of those with some chopped beef. I asked about their other location. They’re hoping to be up and running again before the end of the summer, but the rebuilding plans have to be approved by everybody from the insurance guy to the fellow who sleeps in the caboose, so it’s taking longer than planned. Overall, it was a pretty good meal. The beef was tastier than some chopped beef in the area, and miles better than any sliced beef I’ve found lately. Marie was happier with the pork, which has a good smoke flavor. Both meats needed a little sauce, but not too much, and certainly not as much as they dump on your meal if you forget to ask for it dry. We also enjoyed the corn nuggets, and wouldn’t mind going back for more of them. 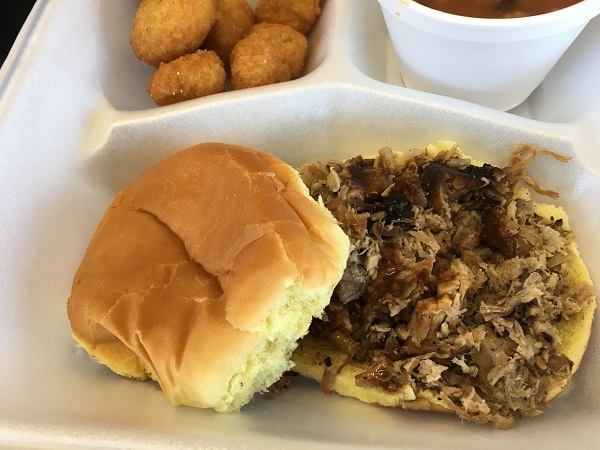 Like most barbecue places in the area, Hwy 58 does most of its business in take-out orders. They do have a few tables, but not many. The two ladies working the window were really friendly and upbeat and anxious to get the other place up and working again. I must share a very silly anecdote about our trip here. When I looked for this place on the map, I was downright amazed to see a business a few doors up the road from them. It turned out to not be what I was expecting; it is a food service company called Great American Deli that packages sandwiches for convenience stores. But the business was founded several decades ago as Maid-Rite, and changed its name sometime between 2006 and now. There is, you may know, a long-existing restaurant chain in the midwest called Maid-Rite. I visited the location in Greenville OH in 2012 and recall the experience very fondly. I absolutely love those “loose meat” sandwiches with onions, pickles, and a little dash of salt. When I saw that building in Google Maps called Maid-Rite, my jaw hit the floor. How was it possible that there could be a Maid-Rite just eight miles from our house and us live here for eight months without me having any idea? Of course, it was all a misunderstanding, which might be why Great American changed their name. I didn’t grumble for too long. After all, Dub’s Place up in Red Bank is just twelve miles from our house and he makes a perfectly good “loose meat” sandwich himself. I made sure to schedule time to go have lunch up there one day the next week. Are you planning a barbecue road trip? You can see all the barbecue restaurants that we have visited for our blog (more than 420 !) on this map, with links back to the original blog posts! Posted on April 14, 2017 by Grant G.Posted in barbecue, chattanooga, tennesseeTagged barbecue, chattanooga, ooltewah, tennessee.